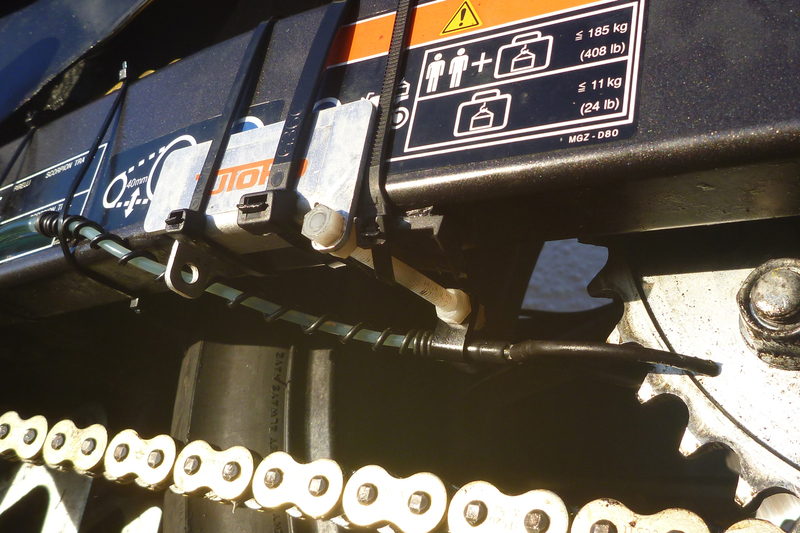 Previously… on the AM Website I fitted a rack and chain oiler to the CB-X. But my chain oiler by the rad (right) wasn’t such a good idea according to Tutoro – too hot for the oil and too hot for the reservoir. At one point I thought somewhere inside the fairing or on the fork would work. 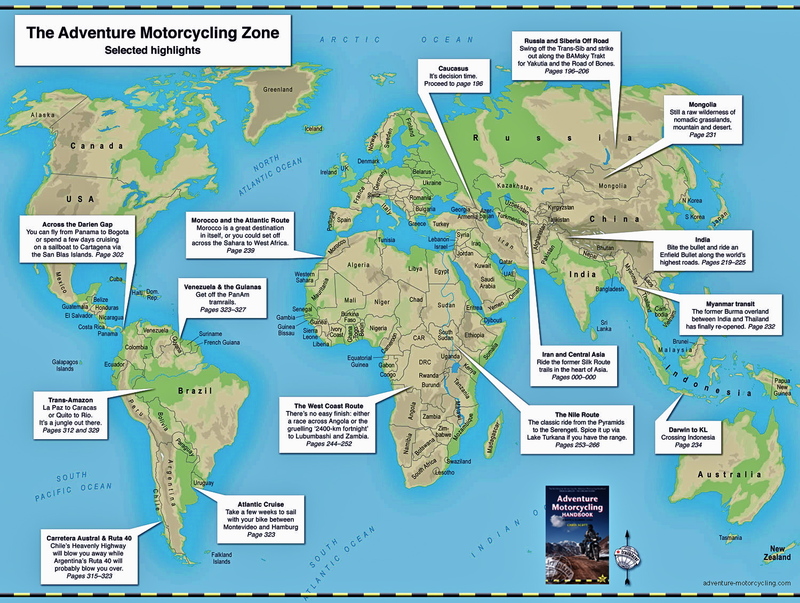 I noted some dirtsome travelling KTMs put their oilers up front for the same reason: out of the way of flying rocks. 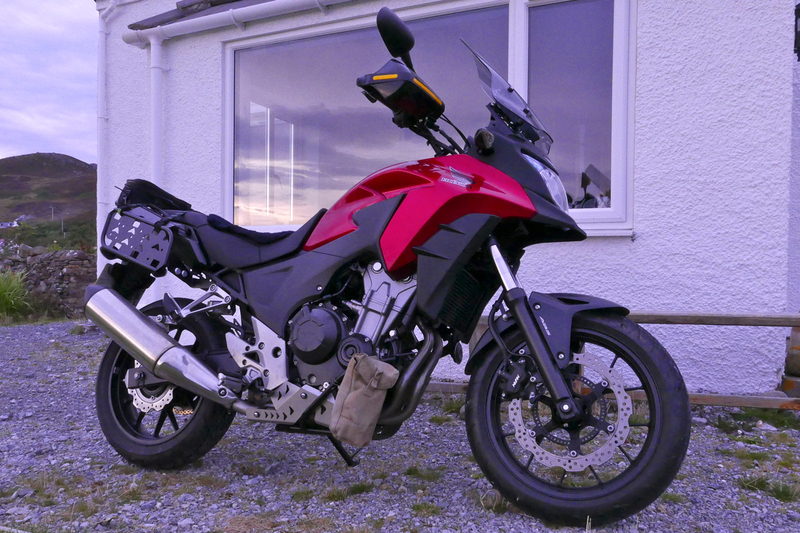 But on the more cluttered CB-X the fairing makes access and topping up too awkward. Can’t be having that. 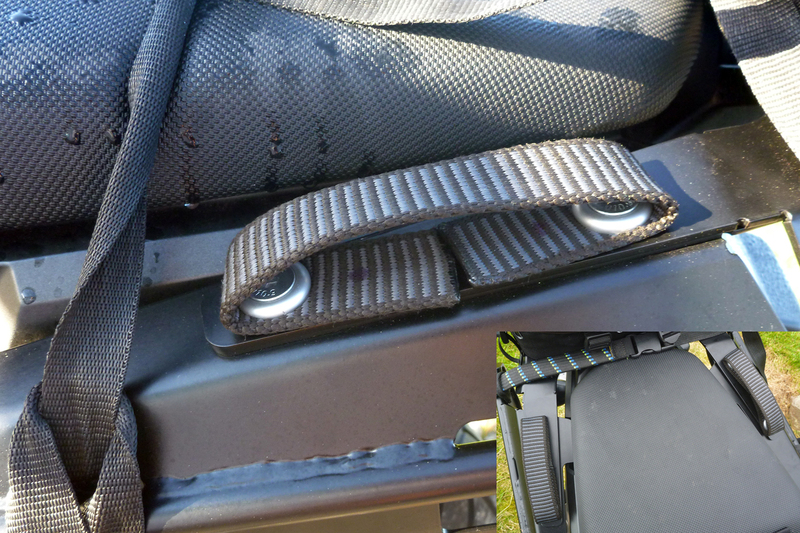 I had another look and decided inside the fold of the Rally Raid pannier rack was as good as it would get on the back. Easy access for flow adjustment and topping up, and anyway it will be the feed nozzle that will get knocked about before the reservoir. 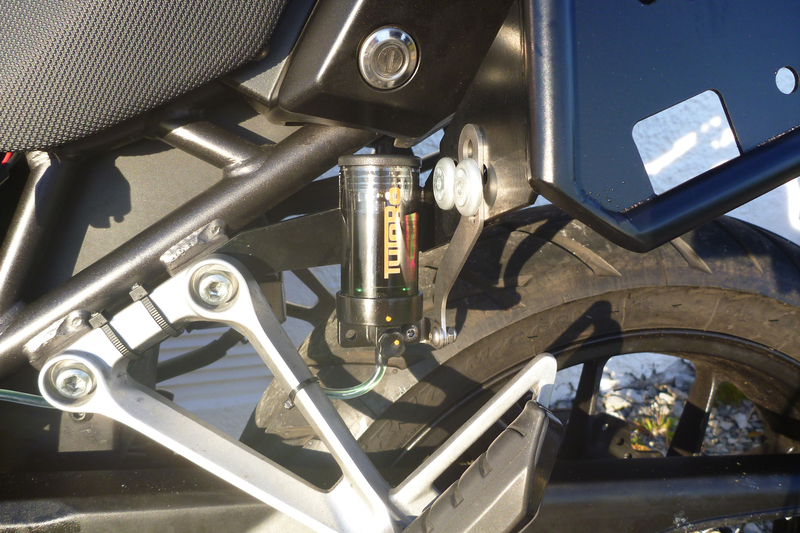 The kit with the Tuturo Auto Pro comes with a range of brackets (right) to help you fit it in the best space available. While in the area I also took a chance to beef up the support for the twin-feed nozzle by adding a spring-coiled section of hose and supporting the sacrificial white nylon bolt with a bit of hard-to-see rubber between it and the swingarm, then zip-tied together (left). Like I say, one flying stone and it’s all gone – better ideas may evolve. I fitted a JT x-ring chain. At only 2600 miles I wasn’t convinced the OE chain – branded a ‘DID’ no less – would last the distance (see the previous post). 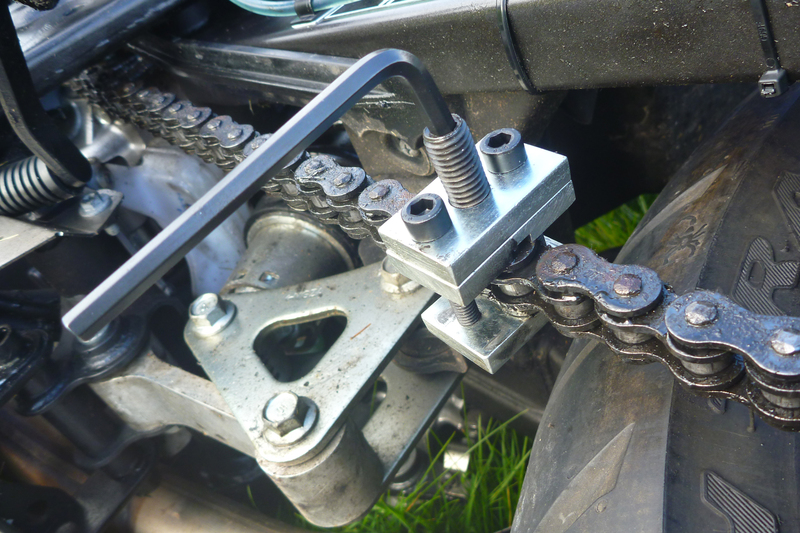 It gave me a chance to use a Motion Pro chain breaker (left) to separate the linkless OE chain – a solid, compact and easy to use bit of kit. I can’t recall the last time I actually did this – usually I just sell the bike. 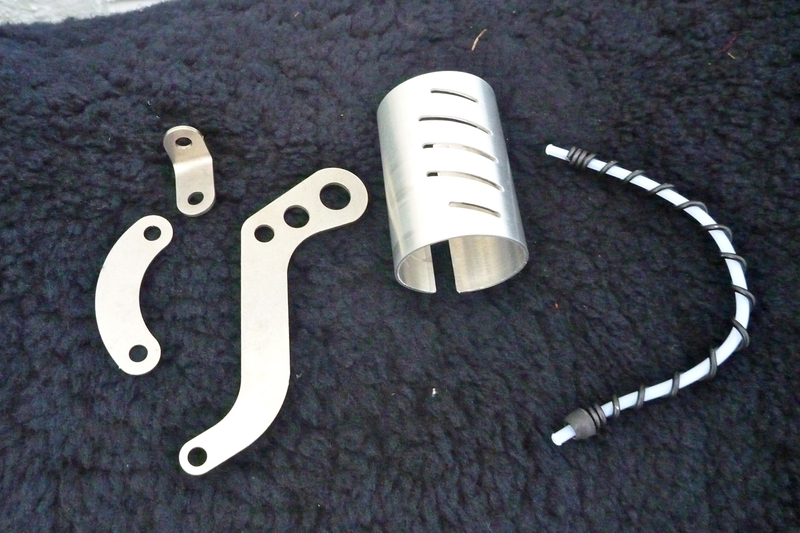 I also had a Motion Pro chain press (right) but decided to go with the spring link despite dire warnings from JT. If it was that deadly they wouldn’t include it in the kit. 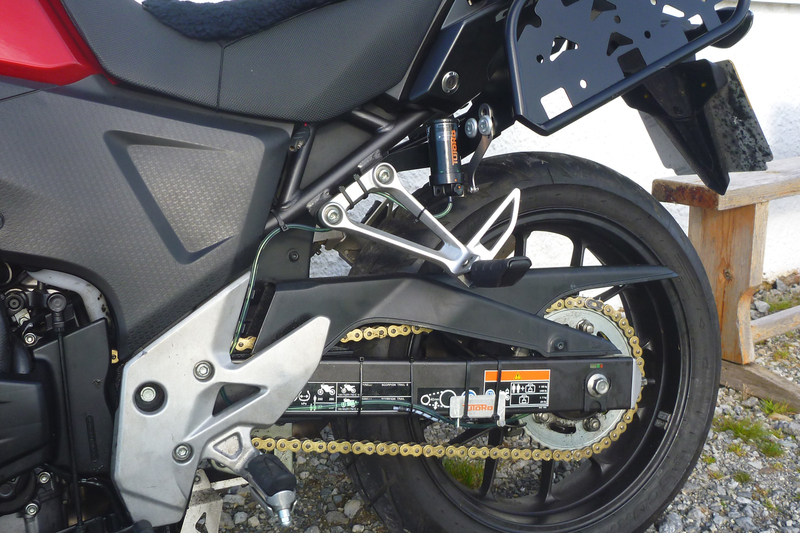 Adventure Spec sells the Motion Pro chain tools. 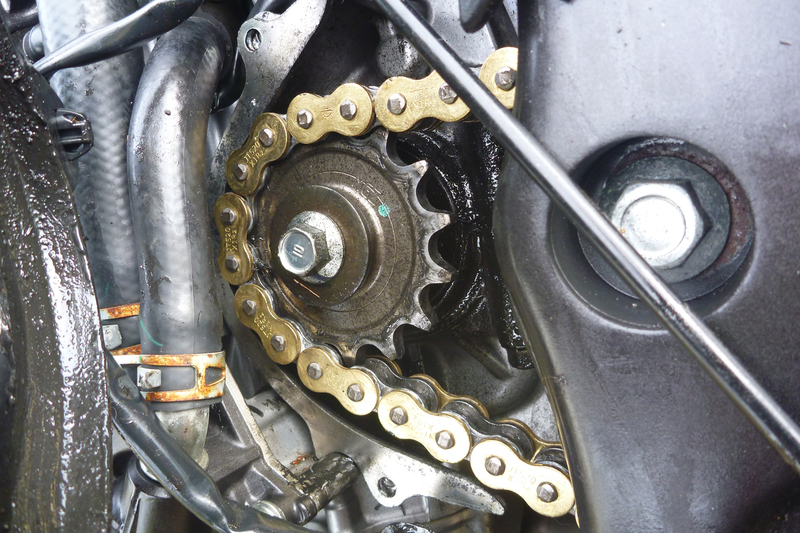 Speaking of broken chains, it was good to see that there was a semblance of a case saver tucked in around the front sprocket (right), though if that hefty JT gold-plate lets go I don’t think there’ll be much to hold it back. 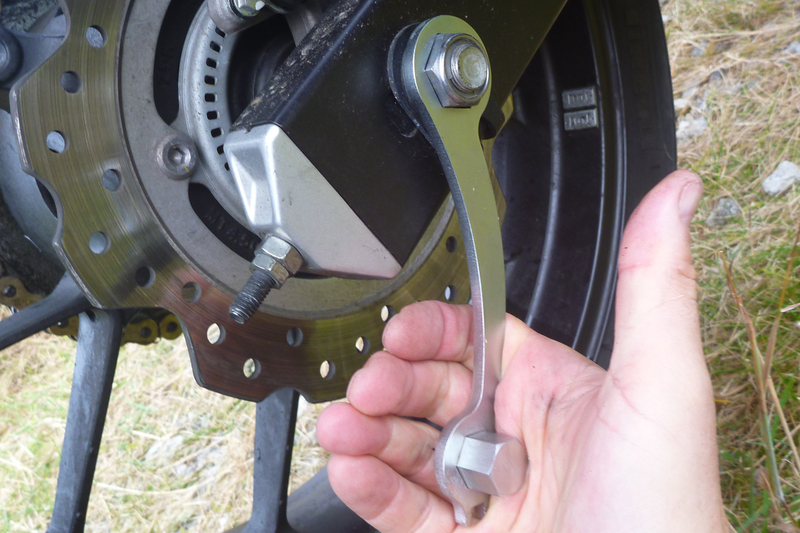 Also, re-adjusting the new chain gave me a chance to use the nifty RRP axle wrench (left) which, it must be said, fits in the hand very nicely and spins round 360° behind the pipe without snagging. Well worth a tenner. 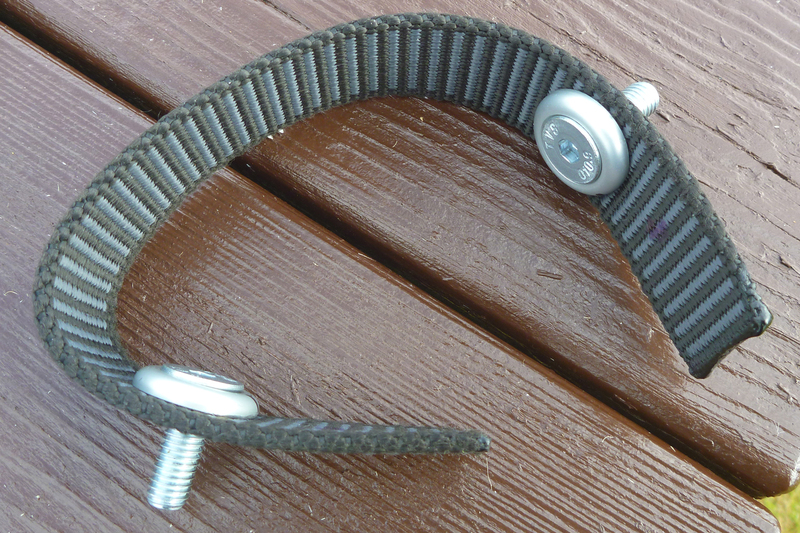 Why oh why can’t we have snail cam chain adjusters back? I’d happily pay the extra £3.76 on the price of a bike. 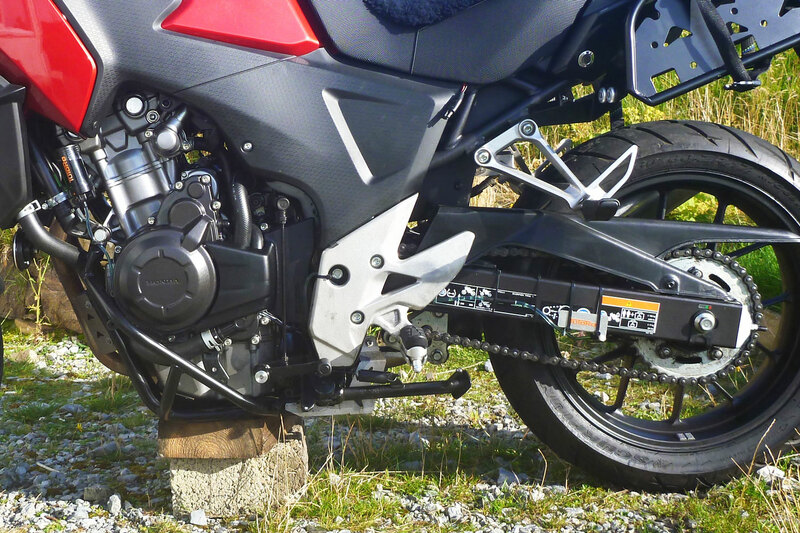 There are no usefully visible alignment marks worth noting on the Honda. 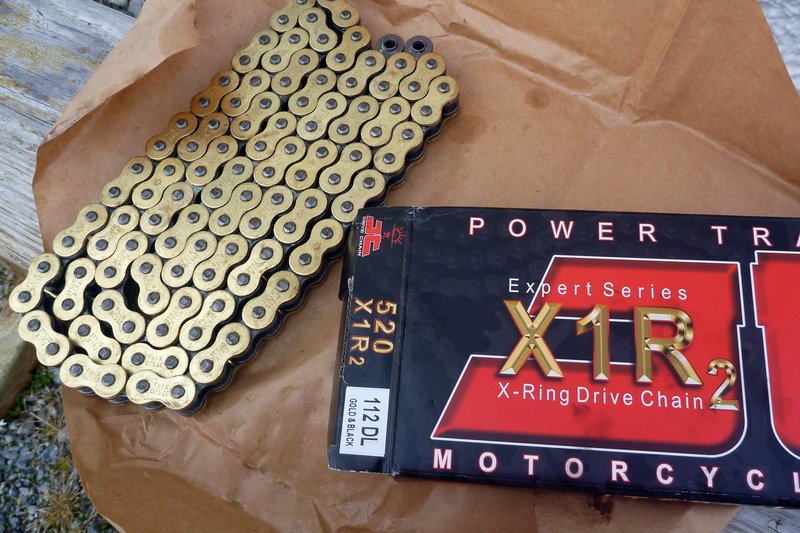 With the new x-ring and chain oiler I’m hopeful I’ll get a good 15,000 miles worth of chain life, even with some desert biking thrown in. This lack of grab rails with the new RRP pannier rack was driving me nuts. With plate rather than tube there’s nothing solid to grab on to when you want to move or pick up the bike. As it looks like getting a sheep rack made for the back isn’t going to happen, I decided on a quick, easy, free and light solution: a thick bit of belt (right). Even before the new chain was dry they came in handy hauling the bike back up to vertical. And if they break I can make another from a passing postman’s satchel or whatever’s lying around. As for the sheep rack; if it’s that important to get a bit of useful width on the back I can screw a bread board to the RRP tail rack. More next time on the AM Website. 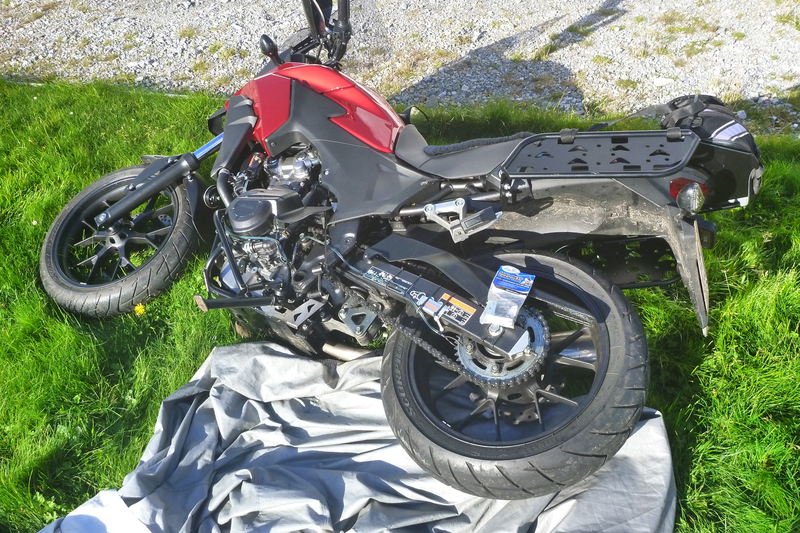 This entry was posted in AMH News, Project: Honda CB500X Rally Raid and tagged JT x-ring chain, Motion Pro chain breaker, Motion Pro chain plate joiner, Rally Raid Products, Tuturo Auto Pro chain oiler. Bookmark the permalink.